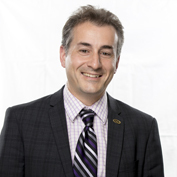 Stéphane Tremblay, MD, MBA, has been Associate Director General of the CIUSSS Estrie – CHUS since 2015, assuring the daily management of strategic operations in physical health and, in 2016, also took on responsibility as director coordinating the academic mission. Integrated management of physical health activities, and improved accessibility across all sectors, are among his main achievements. Prior to 2015, he held the positions of Chief and Director of Pediatrics, Deputy Director and then Director of Professional Services, and finally Director General at the Centre hospitalier universitaire de Sherborooke. He is a representative on the Provincial Primary Care Committee, a member of the Board of Opération Soleil, and a representative on the Executive Committee and the RUIS Table in Sherbrooke. In 2012-13, he participated in the Ministry Working Group on Activity-Based Funding.